Searching for a kid-friendly city getaway where adults can also see and do something totally unique? Chattanooga, Tennessee strikes the right balance for families. With its small town Southern charm and world class attractions, Chattanooga is the perfect destination for a visit with kids of any age, even if you only have a single day to stop in. No destination can be mastered in a day, but sometimes a day is all you have. When my family’s latest travels allowed us to squeeze in a short 24 hour visit to Chattanooga, Tennessee, we jumped at the chance. Although Chattanooga is only a few hours from the city in which I grew up, I had not paid a visit in nearly 30 years. I was long overdue. Chattanooga turned out to be the surprise hit of my family’s Southern road trip. The attractions were ideal for younger kids (ours are 6 and almost 2) while still being interesting and engaging for adults. It’s rare to find a city with so many attractions that strike that balance. While the breadth and variety of family-friendly offerings in Chattanooga definitely warrant a visit of at least a few days, the easy navigability and layout of the city means that you can also see and do a lot even in a shorter visit. Here are the can’t miss highlights in Chattanooga with kids. With the world-famous Monterey Bay Aquarium not far from where I live, my family has a high standard for aquariums in our travels. Without a doubt, the Tennessee Aquarium could go toe-to-toe with any of the world’s best. It also didn’t have the overwhelming and crushing crowds of some of the larger city aquariums we’ve visited on our travels, which can sometimes spoil an otherwise amazing outing. 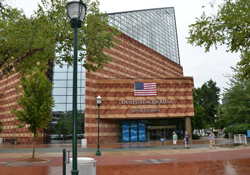 The Tennessee Aquarium is divided into two large buildings – River Journey and Ocean Journey. Highlights for my younger kids included a room with hundreds of live butterflies as well as the touch pools. Entry to the aquarium is good all day long if you want to break up your visit. Children under 3 are free, making the aquarium a great value for families with toddlers since it is an attraction that little ones can still appreciate and enjoy. 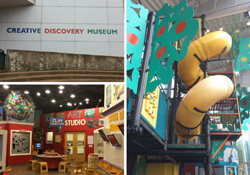 With water play areas, a giant indoor climbing structure, a huge exhibit devoted to music and fine arts, and a separate play area for the littlest visitors, Chattanooga’s Creative Discovery Museum has all the features that make a top-notch children’s museum. For travelers, children’s museums can sometimes be a mixed bag. What works for locals doesn’t always work for tourists paying a city a visit for a short time. The innovative exhibits and intriguing museum architecture at Chattanooga’s Creative Discovery Museum made it something more than just another children’s museum. It is well worth a stop for out-of-towners with younger kids. 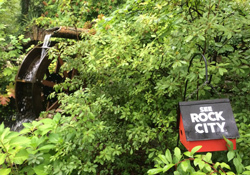 A true highlight of our trip was a visit to Chattanooga’s famous Lookout Mountain and its most well-known attraction, Rock City Gardens. Rock City combines natural beauty (natural rock formations, gorgeous waterfalls and amazing vistas where you can see seven states) with a bit of man-made fairytale magic. 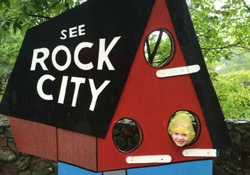 At Rock City, kids will love squeezing through tight spaces between the rocks, watching the waterfalls, and simply seeing the amazing views. 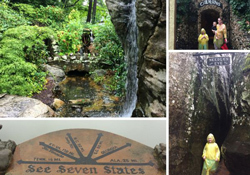 Our 6 year old marveled at Fairyland Caverns (where Rock City’s gnomes live, of course) and Mother Goose Village, an impressively enormous diorama with characters from every fairy tale under the sun. Forget Disney magic… Rock City magic had her transfixed. If you plan to visit Rock City with little ones, be aware that Rock City doesn’t permit strollers as they would never work on the narrow and uneven paths. Bring a baby carrier to transport your little one, which will also help address any safety worries you might have. 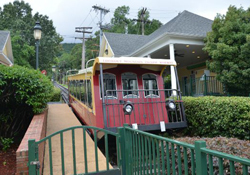 On the other end of Lookout Mountain, closest to Chattanooga, is Incline Railway. It is sure to be a hit with any child who is obsessed with trains. The super-steep funicular railway takes you up to a beautiful vista overlooking the city. But even if rain and fog loom large as they did while we visited, I’d recommend a ride. The sheer engineering marvel of the railway will inspire wonder in your children. One of the most important things to do when traveling is to sample the local delicacies. Chattanooga’s most famous food is the iconic MoonPie – a marshmallow patty sandwiched in between two cookies and coated in chocolate or one of several other flavors. 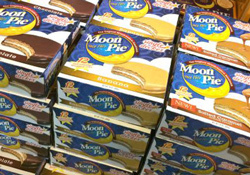 Not far from the Tennessee Aquarium and Creative Discovery Museum is a store where you can purchase every variety MoonPie makes. In case you make time for a visit, my 6-year-old recommends the salted caramel version. With kids, the downtown area near the riverfront close to the Tennessee Aquarium is the place to be. 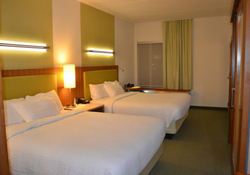 Chattanooga has several hotels within the area and prices are usually exceedingly reasonable. My family stayed at the SpringHill Suites Chattanooga Downtown/Cameron Harbor which was an excellent fit for families with young children. The rooms are all mini-suites which gave us a little extra space for our toddler who had an earlier bedtime than the rest of the family. The hotel also offers a hot breakfast and refrigerators in every room, all included in the price. The hotel was within walking distance to the Aquarium and Creative Discovery Museum, but it would be a bit too long of a walk for little ones unless they are still in a stroller. We chose to drive due to rain and found parking in downtown areas to be plentiful and cheap. We also noticed that there was a city bike share rack in front of the hotel, which would be perfect for getting around town with older kids. Chattanooga has a mid-size regional airport that has frequent service to and from Atlanta (on Delta) or Charlotte (on American, formerly US Airways). A few other cities like Dallas, Detroit, Washington-Reagan, Orlando, and Chicago are also served. Consider doing what we did, which was to fly to Nashville and combine the two cities into a single trip. Both cities are ideal to visit for families with younger kids, and the two hour drive between them is a breeze even if you travel with kids who aren’t fans of long car rides. 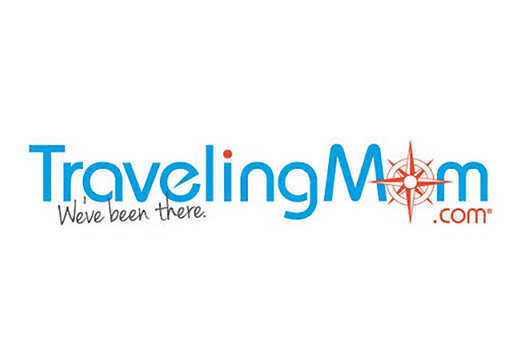 Atlanta is also only two hours away, so it is a viable airport alternative for potentially cheaper prices or another Southern road trip destination. Have you visited Chattanooga with your family? What were the highlights of your trip?